Mentions of “Onion Knights” refers to the PC version, unless otherwise stated. The Onion Knights - Definitive Edition, developed by THEM corporation and produced by Insel Games LTD., is a quirky tower defense for PC with intriguing RPG elements and a fun story. It has no in-game purchases and limited content, unlike its predecessor, The Onion Knights mobile app. Onion Knights has three modes of play: Easy Stage, Hard Stage, and Extreme. The Easy and Hard Stages both have their own map system where you defend different towers at each location, and Extreme is an endless flow of Curry warrior waves to see how long you can last (hint: you won’t last very long until you’ve leveled, upgraded spells, and unlocked at least one more hero slot). What makes Onion Knights unique is the side-scrolling layout of the tower defense, but without the scrolling. Your enemies come from the left of the screen and you attempt to prevent them from breaching your tower on the right. Three knights of the Onion Kingdom stand guard to defend their tower from the evil Curry Kingdom, and you actively play the fourth knight by maneuvering up and down the turret while harnessing the abilities of the other three knights and unlocked hero cards. The other knights with you are stationary, but you use MOBA keys (QWER) to rapid-fire their abilities or chain them for XP boosting combos. Star ratings for each level depend upon these combos to reach max ( three star) ratings. You also have one-to-three hero slots to summon heroes and use their abilities once each round. As you complete rounds, like other tower defense games, you’re awarded loot. However, Onion Knights also gives you a puzzle piece, which you can place in its puzzle. The puzzles are a variety of Onion Knights art and give you numerous gems when you complete the full puzzle. There are up to four puzzles to complete, and each one has smaller pieces than the first, which means it takes more time to finish. It’s up to you to pick which heroes you like, which combos work well together for your play style, which items you want to add, and which knight abilities you want to use and upgrade. Depending on your level in Onion Knights, you can customize your heroes, spells, and knights. Each element has the ability to upgrade and advance in power. 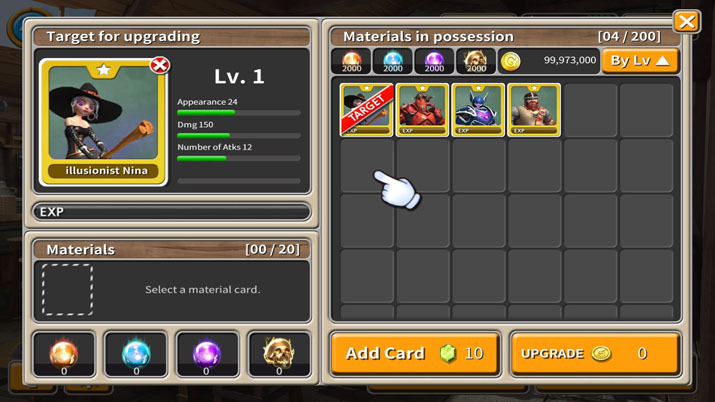 Your chosen hero only has one ability, but you can use hero cards looted through completing defence rounds to give the ability experience and make it stronger. In addition, as you reach certain levels, you unlock new abilities for the knights. You can also spend gold to level and increase ability damage. This allows you to pick a set of skills and abilities to help defend the tower and enhance game interest. You also have the ability to use gems to buy new heroes. Gems are more difficult to earn than gold, but they’re the only way to power up your heroes. As you win rounds, you also can gain item rewards, which you can add to specific rounds. Items can only be used once, but they work great for obtaining the next star rating that you keep missing despite how clean you killed the Curry warriors. Between choosing the knights’ abilities and picking your heroes, you’re able to customize your gameplay and strategy. While you always start with the same abilities and heroes at the beginning, once you reach level ten and unlock a second hero slot, you can play a completely different game than other players. It’s up to you to pick which heroes you like, which combos work well together for your play style, which items you want to add, and which knight abilities you want to use and upgrade. This can easily be a favorite and time-consuming part of the game: trying new heroes is fun, and you’ll want to level your favorites. You’re also likely to replay rounds, just to see if a different hero would work better than your favorite. As you progress in the game, you’ll want to experiment with different hero combos. Just remember you can only have one hero out at a time, which makes having three heroes powerful as you have more time with heroes obliviating waves each round. 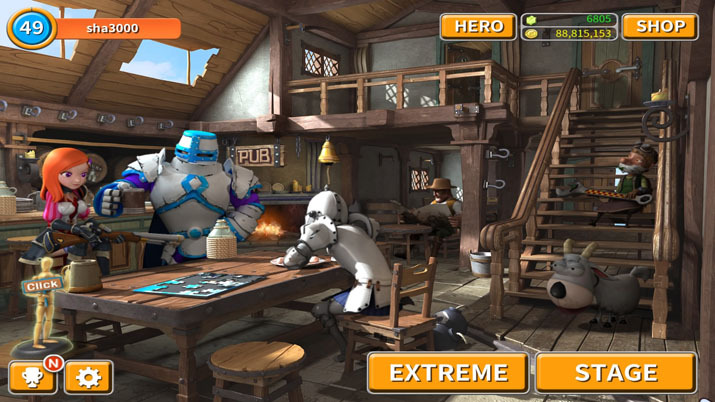 The main menu is a pub where your knights hang out with an old engineer with a goat, and a farmer in the back. The farmer retells the intro story where the Paprika, Mushroom, Carrot, Broccoli, Potato, and Ginger nations have fallen and the Curry Nation is out to destroy your Onion Kingdom. If you click on the old engineer, he rides the goat; if you click on the knights, they wave and smile at you, but nothing else happens. However, there are items you can click that lead you to different pages. By clicking the puzzle on the table at which the knights are seated, you can add your collected puzzle pieces to the board by clicking them. A statue at the bottom corner shows you the gray statues you’ve won. The menus are easy to read and the pub is humorous, especially the goat, but it isn’t intuitive. And upgrading heroes and the knights’ abilities is even less intuitive. There’s a tutorial when you start the game, but it's brief and you’re left to figure out how to do upgrades. Thankfully, Onion Knights is simple, so its lack of an intuitive menu is made up as you don’t have too many things to click to figure out how to upgrade and level your knights’ abilities and heroes. But it does take some trial and error, and you may regret upgrading one hero after you figured out how to obtain a stronger hero (hint, it’s in the store where you spend the gems). Once you figure out how to upgrade your heroes, customize your knights’ spells, spend gold and gems, and place puzzle pieces, Onion Knights is addicting. The Stage rounds (Easy and Hard) are short, so you can play a few rounds if you only have a small pocket of time for games. However, it’s easy to play round after round as you try to level yourself, earn enough gold for knight upgrades, and obtain the gems to buy more hero cards to upgrade your favorite hero, and progress far enough to beat the Hard Stage map. Gameplay is easy to understand but is more challenging as you progress through the map as Curry enemies get stronger and there are more waves to survive through — typical of the genre. Your knights never give up, and the heroes won’t abandon them. Help them save their Onion Kingdom and finish the in-game puzzles that you’d probably never do in real life. Who has time for that anyway?